Previously called the Australian White Horse Register. 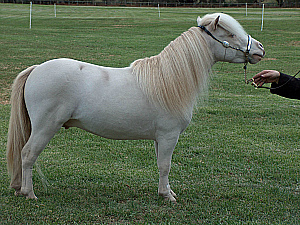 Dilutes Australia cremello, perlinos and smoky cream register for studbook and non-studbook cremello, perlino and smoky cream horses and ponies. Studbook Cremello/Perlino/Smoky Cream Register: mares & stallions - must have 2 registered parents. Proof must be provided. Must PASS conformation standards. Non-studbook Cremello/Perlino/Smoky Cream Register: mares & stallions - either one or both parents are unknown / unregistered / unproveable. Must PASS conformation standards. These horses have full showing rights. Double cremello dilute / dun – caused when the coding for both dun and cremello dilution is inherited from both parents. These horses are eligible for registration as cremellos as they are double cream dilutes. These horses may be almost impossible to distinguish from standard cremellos and perlinos but upon careful inspection they should reveal dun characteristics in varying shades of rust, smoke, peach etc. Must carry two copies of the cream dilution modifier. 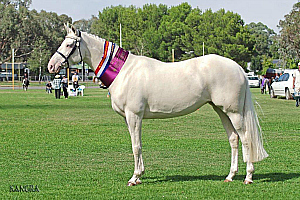 Horses and ponies also carrying another dilution modifier will be primary registered as a cremello, perlino or smoky cream but may also be registered as a composite dilute if they meet skin and eye colour requirements. Have pink skin caused by the cream dilution modifier. Pink skin caused by a pinto modifier is not acceptable. Cremellos must have blue eyes with a dark blue pupil. Perlinos and smoky creams may also have yellow eyes. Wall eyes are not acceptable. Be permitted white markings on the face and legs only, the legs not to be white above the knees or hocks save for a continuous diminishing spear or stripe running above the knee or hock. NO cremello, perlino or smoky cream may have ANY white markings (ie belly splashes) other than those permitted under the Regulations of the Company. Notwithstanding this, an owner may apply to have a horse or pony accepted for registration under the company's hardship clause which allows for small amounts of underbelly white. CREMELLO - double dilute chestnut. Distinguished by their light cream to ivory coat colour and lighter, 'palomino type' manes and tails, although some may appear to be white from head to tail. Facial and leg markings do occur and are not considered a fault. PERLINO - double dilute bay or brown. Generally have body hair lighter than their manes and tails and may have sooty legs where the base coat has black hair pigment. However, depending upon the base colour (ie bay), this is not always the case; some perlinos are almost impossible to distinguish from cremellos and will only be ‘found out’ when they produce buckskins to chestnut or palomino partners. The perlino colour can therefore range from being virtually indistinguishable from the cremello through to the dark perlino (double dilute on brown). SMOKY CREAM - double dilute black. Generally have very dark reddish coloured manes and tails with a dark cream body colour. However, without a DNA test for agouti status, smoky creams may be difficult to distinguish from double cream on brown. SMOKY CREAM DUN – double cream dilute / grullo. Mane, tail, legs and dun characteristics will generally be a smoky colour. PERLINO DUN – double cream dilute / bay or brown dun. Mane, tail, legs and dun characteristics may be peach, rust, smoky etc. CREMELLO DUN – double cream dilute / red dun. Very hard to distinguish from the standard cremello but may sometimes exhibit faint dun characteristics.